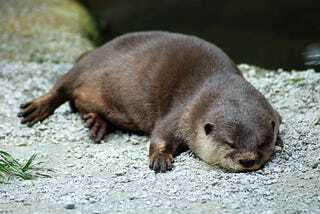 Shh....Be very, very quiet, The otter is sleeping. Today, I have an excuse for you. I'm exhausted. Monday and Tuesday were not good days work-wise. Network at a school took a crap, and I'm the fixer. Last couple of days were early and long. Today, I got home at 3:15, and at 3:20 I got a call that the network had just gone down again. FFFFUUUUUU!!!!!!! So, because I'm already exhausted, and it's going to be another early day, this is my oddity post for today. There is no oddity. Not even a quick quip because my brain went to sleep about 12 hours ago, and I don't want to wake it up, otherwise it'll be up all night. There are 10 body parts that have three letters. Hip, lip, gum, arm, eye, toe, leg, jaw, rib and ear. Also, the highest point in Pennsylvania is lower than the lowest point in Colorado. And, the United States has never lost a war when mules were used by the army. And finally, minus 40 degrees celsius is the same as minus 40 degrees fahrenheit. Now, I'm going to bed. And, when I wake up, I'll wish I was still sleeping. Nighty-night.